Last year at NTE 2011, we got a lot of positive feedback on the music we played before (and after) each of the main sessions. We’ve re-used a lot of the same music and thrown in some great new tracks from a bunch of different places, and so I thought it would be good to share the playlist with you! The songs are in no particular order – we mixed up the playlist each night depending on the mood and theme we were wanting to reflect! On the 20th of August, I had the great privilege of serving at this year’s Rice Rally, held at the Sydney Entertainment Centre. I was blown away at the work God did that night, when about 1/5th of the 3500+ audience walked out, and either decided to follow Jesus for the first time, or recommitted their lives to Christ. A good friend of mine, the audio engineer for Sydney Christian band, Garage Hymnal, came along to check out what we were up to from near the end of sound check, through to the end of bump out when we started loading two trucks worth of production equipment. He made an interesting observation while we were waiting for the event to start, that I had been completely oblivious to; “Everyone is so calm!!!”. That proclamation was followed by a discussion of the production team and culture that I’d seen (and been a part of) at the Rice movement, compared to many other Christian events I’ve been involved with or seen run. We both agreed that Rice was one of the best run large-scale Christian events that either of us had seen. I won’t be the first to point out that Rice Rally has a reasonably large budget (roughly $80 000), but I’m sure that this in itself is not the driving factor in why everything went so well. Anyone with even a small amount of experience in production will tell you that if you get great people on board, you can deliver great results. As my friend and I chatted, we realised that many Christian events are run by people who only have experience working inside the Sydney Christian ‘bubble’. These people often don’t have the same insight into how a professional production is run (sometime where big money is at stake). At Rice Rally, every team member serving on the production crew in a key leadership role (TV, Lighting, Audio, Stage Management) had experience in their area of expertise outside of a church environment. 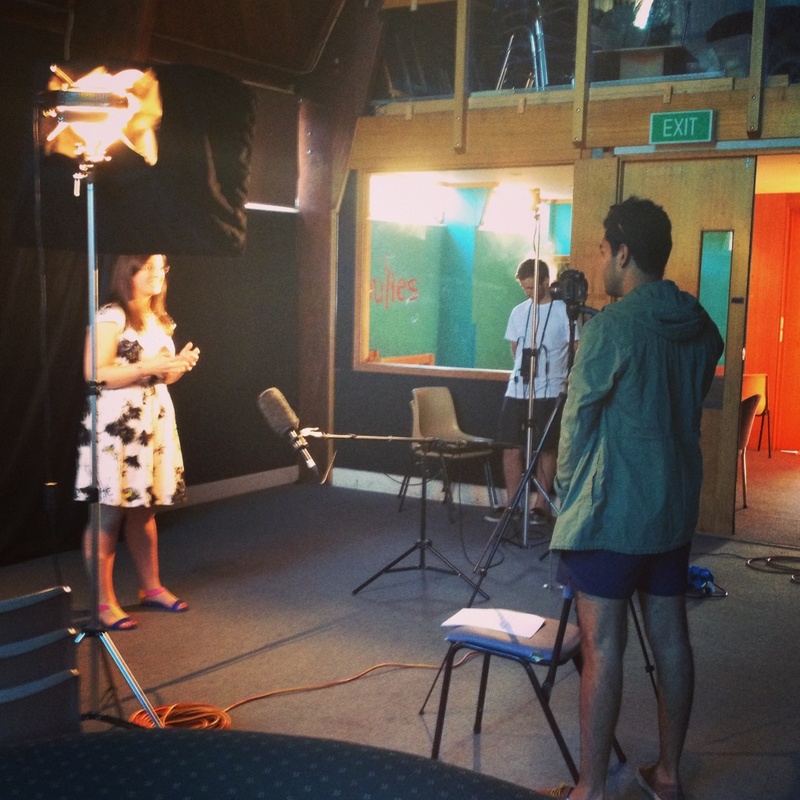 We had all worked in secular environments where we had gained invaluable experience that went beyond what can often be found in Christian production teams in Sydney. We also had the budget for good communications equipment (on top of the professional audio/lighting/vision rig), so that the team could effectively get messages between all the different people involved, which undoubtedly is the most important part of any successful event. As well as a great group of knowledgable, and technical, production team members we had a great team of volunteers. When I arrived at 7am to begin unloading the truck, right through to when I left at 10:30pm as the truck was being loaded again, there were around 20 people willing to help. They were ready to do everything and anything we asked, and did it without complaining. Rally would not have run without all the volunteers – they helped us with man power, moving road cases, (un)rolling cable, placing equipment, labelling microphone cables and many other things that are simple, but time consuming. This enabled the production team to get on with jobs that required technical knowledge and made these jobs a lot easier. It also saved significantly on costs as we didn’t have to employ 20 people to do everything they did. I was simply blown away at how great and helpful all the volunteers were! Upon looking back, I’m honestly not sure how my experience at Rally can be applied to other events I work on. I think a lot of what my experience highlighted is a culture from the top down, that wants to glorify God and produce a great event where Christians can bring their friends. It appears that the vision for the Rice Movement is communicated very effectively, and that people want to commit to the vision and serve in any way they can to make it a reality. In my opinion, this was the key to the success of Rice. I certainly learnt a lot about leading volunteers, which I’ll address in another post, along with other things I’ve learn through working in a mixed (Christian/secular) environment at a later date. However, for now, I’d be interested in hearing other peoples’ experience in leading with volunteers, finding the right people for a team, and thoughts on how to motivate people to get on board and serve. Leave your comments in the area below! Check out the Rice Movement! In my experience of running and working in production teams for various Christian organisations, that there seems to be a divide between those like to use haze and those who don’t. Often, people from both sides approach this topic with some preconceptions about why or why not to use haze in events of any scale. I hope that this post (and the one to follow) helps to dispel some myths that I think stand behind these preconceptions. At an event recently (that I attended, not as a member of a production team) the church had a cheap smoke machine sitting behind the drummer, with someone sitting next to it pressing a button to fire a thick, white substance out of it. The substance dispersed rather quickly in to the building and didn’t really add too much to the overall event. Commonly, when I speak of haze or smoke, this is what people think of. However, the above example is not a true representation of what good haze is. Haze is not an ugly, white, beam blasting out of a noisy (and usually cheap) machine. Instead, it’s often a thin, somewhat transparent, solution which fills a room, without dispersing into the environment almost as quickly as it entered it. While a smoke machine does have its place in some productions for a spontaneous effect, generally, I think that what people really need is a haze machine which, while often much more expensive, provides a more even coverage and can be controlled in finer detail. In part two of this series, I’ll write about times I think it’s appropriate and inappropriate to use haze in Christian gatherings, but I think it’s important to outline some reasons for using it at all. An example of a large space. Taken during bump out at NTE 2011. Firstly, in a larger gathering, in a large space, I feel that haze allows for a gathering of people to feel better ‘connectedness’ with one another. This is applicable when singing corporately, when often a large space can feel empty, and I think is important in relation to Paul’s command to encourage one another in Hebrews 10. I personally find it very encouraging when singing to God, and doing it with a group of people. If the environment I’m in feels like a closer community (which can happen through many other ways too), I think the encouragement of engaging in this part of worship to God is greater. Haze can be used to fill the empty space and ‘pad out’ the room and add to this community feel. Additionally, these larger spaces usually aren’t designed explicitly with a christian gathering in mind and/or not as a traditional ‘church’ space. Buildings that come to mind when we talk about this are the ‘big shed’ at the Exhibition Park in Canberra that we use for the AFES National Training Event, the main auditorium at the Katoomba Christian Convention, and the larger space at The Tops Conference Centre. Secondly, there are a couple of technical reasons to use haze, which come out of the point stated above. If you’re in any sort of larger gathering, it would be safe to assume that you’re going to have some form of lighting to do ‘front fill’ and perhaps some lighting for some ‘up and out’ effects, or any mixture of those two. Haze can be used to fill the empty space between music team members, and between the music team and the congregation. In some tech circles, we would name this creating ‘depth’ on the platform, and will also help a lighting operator and designer to highlight portions of the platform that require attention. It is my hope that after considering the above points, that people may approach the use of haze, with a renewed view. I certainly, in my work as a lighting operator, don’t use haze to create a ‘rock concert’ environment. Some events are produced with a certain look, feeling or ‘vibe’ in mind, and haze can often be used to enhance this. There are many other things that can contribute to this too – but I feel that haze should be considered as one of these things and not simply dismissed. As you’ll see in my next post, there are certainly times where haze is not called for – and motives need to be checked before any use of technology in production environments, but I do think that there are valid reasons for using it too! I’d love to hear your thoughts on this topic in the comments section below.